Which Wedding Veil Designs Should You Choose? Are Best For Your Dress? Too many wedding veil designs to choose from? Should you try to wear a single tier, two tier or three tier veil? What length bridal veil goes best with your dress? Should you consider an elbow length veil or chapel length veil? 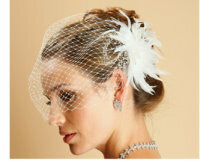 Or will a birdcage veil work best for your bridal gown style? When it comes to the edging trim... should you go with a plain edge, embroidered pencil edge, corded edge, ribbon edge or beaded edge on the veil? What determines which bridal veil design you should choose? 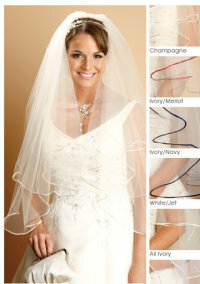 Most wedding veil designs are made out of one of these netting fabrics: illusion, tulle, maline and french net. Illusion or tulle net is what you see most wedding veils made from. Most are sewn on combs, which makes it easier to remove. But bridal veiling can be placed on barrettes and attached to some headpieces. Illusion net comes in various shades of white and ivory. You will find silk white to a creamy ivory color. If you have a colored wedding dress like red, you can buy a white veil with red cording on the edge. You can also buy a red veil, but you must make sure that the color is the same shade as your wedding dress. It is best to try a veil on with your gown to see which bridal veil design and length looks best. Even if you don't want to buy the one in the bridal shop, because it may be a bit pricey, you will at least have an idea of which wedding veil designs look best on you and then order it elsewhere. Wedding veils come in many lengths. What are they? One popular length is the elbow length, and there are shorter length veils, that work well for informal wedding gowns. Most brides tend to want to go shorter these days. That is why the birdcage veil is so popular. The birdcage bridal veils and visor veils work best with certain style wedding dresses. Usually informal styles, like a beach wedding dress, destination wedding dress or a vintage style wedding dress work the best with birdcage veils. The fingertip length veil is one that work well for informal and formal weddings. Chapel length wedding veils usually are floor length and can be used for semi-formal and formal weddings. Cathedral length bridal veils are used more for formal weddings. These veils go out 1 foot or more on the floor. Typically the veil is as long as the train. Sometimes brides who don't have a long train on their bridal dress will wear this type of veil for a train effect. This is considered a "no-no" by some bridal experts, because your veil shouldn't be longer than the train. But nowadays most anything is acceptable. Mantilla wedding veil designs are circular or oval shaped veils that lay flat on your head and are attached with hairpins or small combs. Some mantilla's cover the face and others attach right at the forehead or bang area. They are usually edged in wide scalloped edged laces. Which Veil Edging Works Best With Your Gown? The most popular edging is what is called the pencil edge. This is a very tight narrow overcast hem. You can have rattail cord, various width ribbons, pearls and rhinestones applied to the edge. Some edges are shaped and embroidered. Some are decorated close to the edge with beads and crystals. If you have a lot going on already on your dress... you may not want to over do it by adding a veil with a lot of detail on it. A wedding veil design with just a cut edge or simple edging like the pencil edge, ribbon, cording would be all that is needed. A simple single row of beads or crystals will also work. If you have a simple wedding dress.... then you can look at more elaborate wedding veil designs. The embroidered styles or the beaded detail veils will add just a little sparkle to finish off your look. Of course if you are a bride who wants to keep it simple, all the way, then do a plain cut edge or a simple edging. How are you going to wear your hair? Your hair style will help you decide how to wear your veil. If you are doing an elaborate bridal hair style like an up- do, you should wear your veil behind it and not over top of it. You might consider wearing the veil in front of the up- do style if you are going to wear a blusher veil over your face. Low buns in the back of the head usually will have the veil placed just under it or right over top of them. You can wear the veil close to the front top of your head for the face framing look. If you wear your hair down then the best place to wear your veil is on top of your head. You can wear the veil alone or place directly behind a tiara or headpiece. An up and down hair style is versatile because you can place the veil at the back or the top of your head. If you use a 2 tier wedding veil design, you can use the top layer as blusher to go over your face. Just remember... the further back on your head the veil is placed the longer the veil has to be to go over your face. You want the veil to fall past your chin at the very least. A good place for it to fall is chest level. If for some reason you cannot find a veil that is right for you, you can have one custom made or make one yourself. Sometimes you need one that is not as full and as long as what the bridal shops carry. Or maybe you need a special color to match your gown. A wedding dress maker will be glad to do this for you. To sum it up... make sure the wedding veil design you choose works well with the formality of your wedding and the style of your gown. Make sure any beading on the veil harmonizes with the beading on the gown. Once you choose the hairstyle you will wear for your wedding, you can focus on what type of headpiece, tiara or hair jewelry you will use in your hair. Here is some advice that can help you make the right choice. Before you can pick your wedding veil design or tiara you need to figure out how you will wear your hair. This article will help you pick the right hair style. Which necklace and earring styles work better with your wedding dress? Learn how to choose your bridal jewelry to match your dress and styles that will compliment you. If you are the DIY type, you will find making a veil to be easy if you follow these steps.